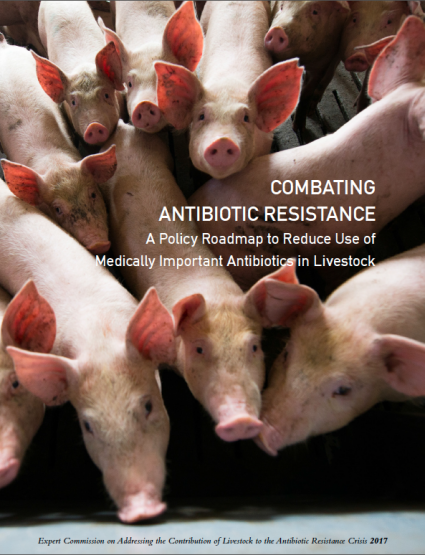 Medical and public health organizations around the world agree that more prudent use of antibiotics in human medicine and in livestock production is paramount to slow the spread of antibiotic resistance. Of particular concern is the widespread use of antibiotics important to human medicine in food animals. In the U.S., such use accounts for 70% of all sales of medically important antibiotics. It is against this backdrop that 12 antibiotic resistance experts from the fields of infectious disease medicine, veterinary medicine, microbiology, epidemiology and public health joined to craft a policy roadmap to help move the U.S. forward in addressing the contribution of livestock antibiotic use to the growing global threat of antibiotic resistance. The policy roadmap consists of 11 core policy recommendations that are aimed at a broad set of stakeholders: federal, state and local policymakers, food companies, institutional food purchasers (i.e. hospitals, schools and universities), and medical groups. The recommendations are split into three key areas: 1) decreasing livestock use of medically important antibiotics; 2) monitoring livestock antibiotic use, and 3) enhancing surveillance and data integration to inform antibiotic resistance policy.